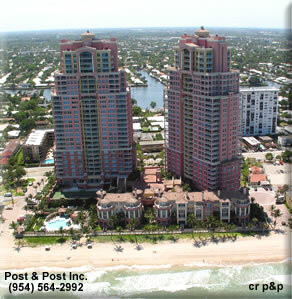 Contact the #1 Brokers in Beach Condo Sales! 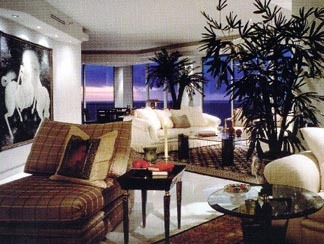 "The Palms" is set between the Atlantic Ocean and the Intracoastal waterway. The classically designed twin towers are surrounded by lush landscaped grounds. The Palms features a state-of-the-art Fitness Center, Business Center, a boardroom for meetings, and an exquisitely beautiful entertaining space for celebrations and much more. Thinking of buying at The Palms or selling at The Palms? Call the #1 Brokers in Beach Condo Sales or fill out the form below. Computerized Security controlled high speed elevator system including custom designed elevator cabs with private access to most residences. Grand entry foyers with coffered ceilings, 9' and 10' ceiling heights. Elegant double hardwood door entry (most units). 24 hour valet. 24 hour security. Secured service entry with separate elevator access. Ocean to Intracoastal see through floor plans (most units). Large capacity washer/dryer. Floor to ceiling energy saving blue/green tinted window glazing and glass balconies for unobstructed views. Large terraces with access from Living Room and Master Bedroom (most units). State-of-the-art residence security system directly wired to the main security station. Oversized walk-in wardrobes. Pre-wired for multi-line telephone system and cable television. Covered private parking. Bicycle storage. Private tenant storage. Ceiling fan outlets (see floor plans for details). Snaidero Italian cabinets with under cabinet task lighting. Sub-Zero built-in refrigerator/freezer with cabinetry front panels. KitchenAid 30" ceramic glass radiant cooktop. KitchenAid Dishwasher with stainless steel tub, sound insulated. KitchenAid double convection oven/microwave. 3 cm bullnose granite countertops with 4" backsplash. Stainless steel double sink with designer fixtures and disposal. Elegantly appointed master baths. Snaidero cabinetry with 3 cm Italian bullnose marble countertops. Italian marble flooring throughout the bathrooms. Mirror over vanities to ceiling with designer lighting features. Luxurious whirlpool tub surrounded in marble with 12" backsplash. Frameless glass enclosed showers with hand held shower (most units), marble benches and niches. Master bedroom terraces with magnificent ocean or Intracoastal views. Twin towers rising majestically above the pristine Atlantic Ocean along with 7 exclusive oceanfront villas with classic Mediterranean design, keystone columns and barrel tile roofs. An elegant winding entry with 24 hour manned gatehouse. Once through our grand archway with it's dramatic ocean view; one arrives at the Grand Piazza with its lovely cascading fountain. Lush tropical landscaping and magnificent palm lined beach maintained by professional gardeners to enhance the beauty of the ocean and beach. Walk out to over 450 feet of white sand beach and elevated boardwalk. The Palms Pool & Beach Club offers a heated pool and spa surrounded by a lushly landscaped sundeck, lounge chairs and tables with his and her cabanas, an attendant for daily towel and mat service and oceanfront showers and footbaths. As a resident of The Palms, you'll enjoy The Palms Club. A magnificent two story 15,000 sq. ft. facility overlooking the ocean and the pool. A beautiful Fitness Center complemented by a full array of state-of-the-art exercise equipment. His and her locker rooms complete with sauna, steam, massage and treatment rooms. Indoor air conditioned, Racquetball Court with glass back. Aerobics room. Tennis court overlooking the ocean. Elegantly furnished meeting and entertainment rooms for private and social activities with terrace overlooking the ocean. The Club offers beautifully appointed rooms with fully equipped kitchen and bar for private gatherings. Concierge services available exclusively to residents of The Palms. Business center with grand boardroom for business meetings. Computer, fax and photocopy facilities. Shopping. Just a few blocks to Galleria Mall (Saks Fifth Avenue, Neiman Marcus) and a short drive to Las Olas Boulevard. Dining. World class restaurants to cater to every taste. Travel. Hollywood/Fort Lauderdale International Airport conveniently located nearby. Marine. Just a short drive to Pier 66, Bahia Mar and other convenient full service marinas, as well as world class golf courses. Nearby houses of worship and medical institutions like world renowned Cleveland Clinic. Public schools minutes away. Some of the finest schools in the state within minutes from your community.